I often can’t decide what my favorite season is but fall has to be up there because there are so many things I love about it. The cooler temps, the pretty leaves, trips to the apple orchard and pumpkin patch, both the girls birthdays, oh and all the baking and everything apple, squash, caramel, spice, and PUMPKIN! I love them all and actually maybe apple a little more than pumpkin, I know, I know I said it but I do love pumpkin. The first day of fall is finally here and I held out with the pumpkin later than usual this year and even longer to post pumpkin recipes. Some years the fall bug bites early and sometimes the weather just doesn’t get the memo and it’s hot and I’m craving the fabulous flavors of fall. In these cases I think back to being pregnant with A, years and years ago, 8 to be exact. I was out of work early, not on bed rest but restricted activity and I ate all the candy corn, pumpkin, and M&M mix and pumpkin and caramel ice creams. Yep went from not gaining much weight to finally gaining those last couple weeks. 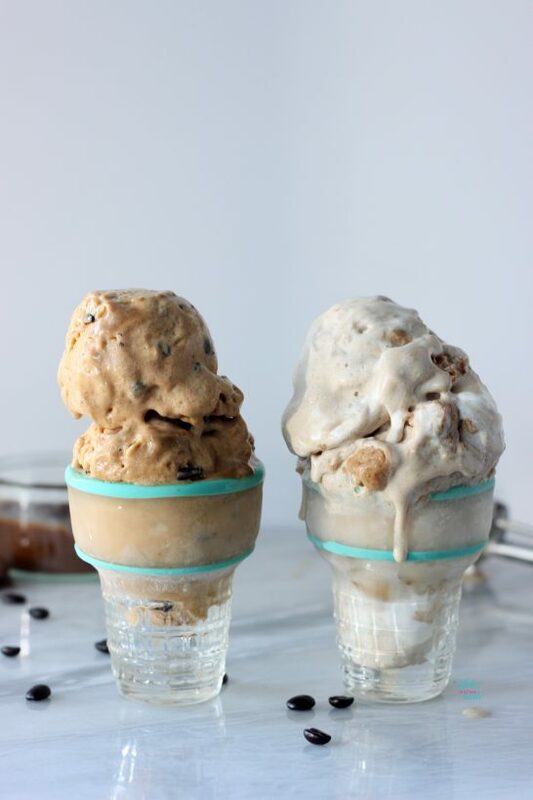 Well those pumpkin ice creams they don’t come in dairy free and after playing with ice creams a few weeks ago to make our own flavors quick and easy with two S’mores Ice Cream I knew that I had to make pumpkin flavors. Pumpkin ice cream was something I had thought about making the last few years with the So Delicious Pumpkin Spice Coconut Milk but never got around to as I was always stuck on if I should get an ice cream maker or not. Well this time I whipped up a Pumpkin Pie Ice Cream using So Delicious Snickerdoodle Cashew Milk Ice Cream. It’s one of my favorite flavors, especially for fall with apples. Quick and easy since it already has the Snickerdoodles just add pumpkin, spices, and of course whipped cream! Than I made a Caramel Pumpkin Latte flavor as well since I had some extra caramel in the fridge from all the Caramel Apple Cheesecake and extras for apples. I actually wasn’t sure I would get this posted today as I’m on my way out of town for a girls weekend… I’m so excited! It’s a place my friend and I have talked about going for years and finally things fell into place and we’re going to the Cranberry Festival! So watch Instagram and Instagram Stories for all the foodie fun! If you like cranberries like me stay tuned because I’m pretty sure I’m going to be so inspired by everything! Pull ice cream out and let sit on the counter to soften, about 20 minutes. In a small bowl mix together pumpkin, sweetener, and pumpkin pie spice. In a large mixing bowl using a hand mixer mix the softened ice cream together. This will make it all smooth and consistent, making your additions even. Fold pumpkin mixture into the ice cream. 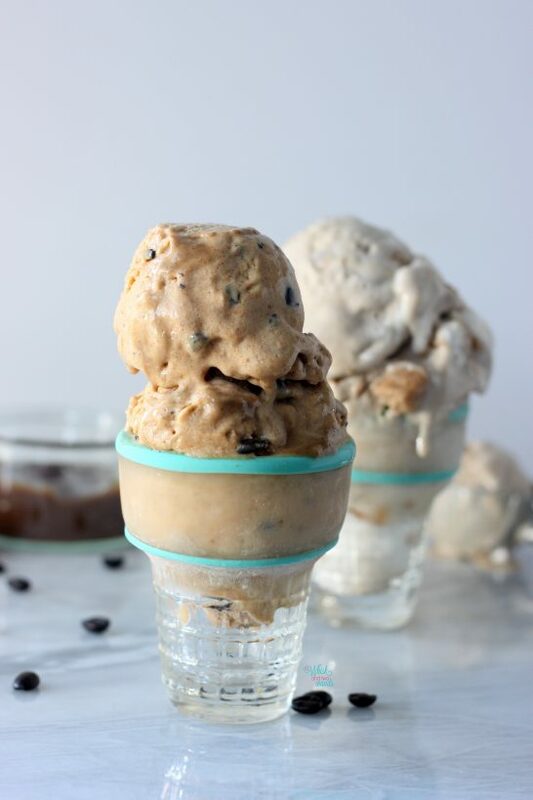 For Caramel Pumpkin Latte Ice Cream fold in chopped espresso beans. our mixture into a non stick or glass standard 9×5 bread pan. 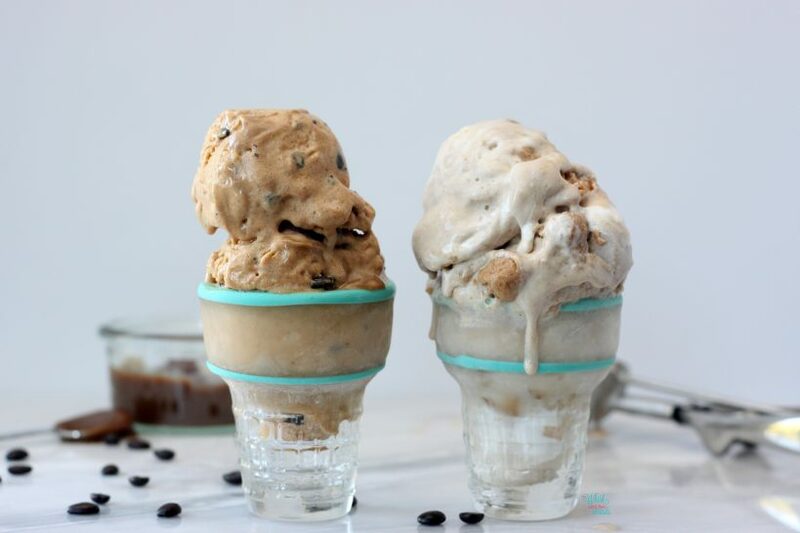 Drizzle caramel from across the top of the ice cream and run a toothpick through it to swirl. Place mixture in the freezer to set, or at least 2 hours, depending on your freezer. When ready remove the bread pan, if it’s been in there 6 hours or overnight you may want to wait 5 minutes before scooping, it will be like a normal pint of ice cream vs more of a soft serve. We like to leave ours in there until fully set. Scoop into your favorite dish or cone and enjoy! 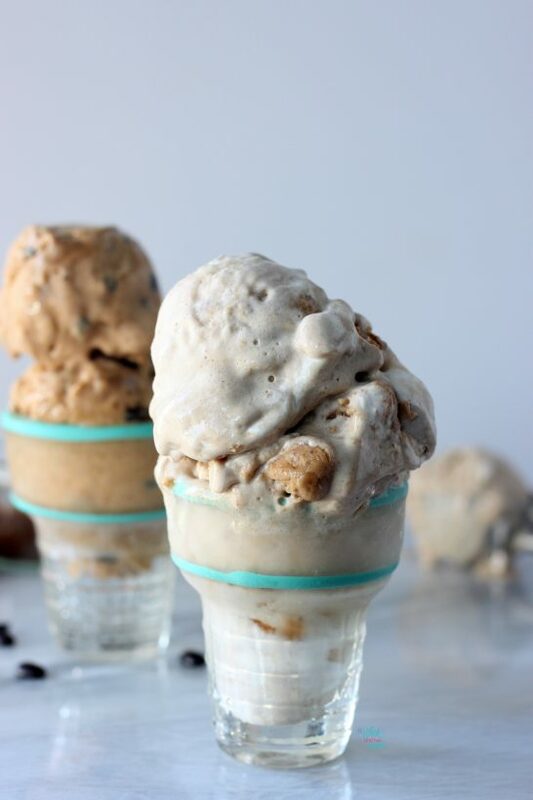 Delicious easy o make, no machine required, pumpkin ice creams! Pumpkin Pie Ice Cream and Caramel Pumpkin Latte Ice Cream, dairy free, gluten free, and vegan! oh wow the caramel pumpkin latte looks amazing! You have the best desserts! Haha! Those glass ice cream cones are my new favorite thing! So cute! Keeps it cold! Thank you, I will cry the day they break I love them! Genius for just mixing the two!! YUM!! Sarah Grace recently posted…Sea Salt Crispy Chickpeas – A Salty Craving Cure! Thank you! So quick, easy, and delicious! I love ice cream anytime of the year and these pumpkin versions look amazing. I especially love the sounds of the first one with the cookie – I don’t think I will be sharing that with anyone. Oh my goodness, this is genius! I bet it’s over the top creamy and indulgent.